Do you have a Long Island Golden Retriever Rescue dog who LOVES everyone (i.e. adults, kids & other dogs)? Are you a student looking for a fun & rewarding Community Service project? If the answer is "Yes! ", please join our PETCO® Team. 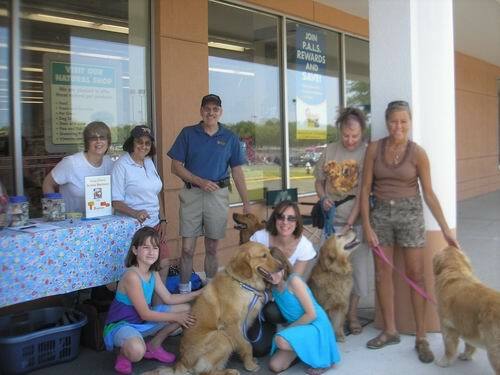 We have volunteers who do monthly educational and fundraising events at many PETCO® locations across Long Island. We are looking for additional volunteers. Come and be part of the LIGRR miracle...you know, the one which brought your wonderful dog home to you. Please help! You can start by filling out a Volunteer Application & faxing it to LIGRR. Please make a note on your application that you would like to join our PETCO® team. PETCO® is a trademark of PETCO® Animal Supplies, Inc.